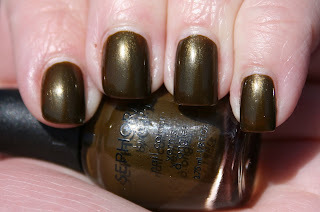 described as: Fashion-forward, wearable nail color in an opaque dark army brown. By the way, they totally put "opaque" on every.single.color.description. I'm a little "meh" about this one. The application was fabulous, but the color is a little too baby-poop for me. I think I'll have to top it with something today.... any ideas? I'm kinda meh on it too. Kinda like it and kinda don't.